While the earliest horse drawn tramways connected coal pits to local canals or to the coast, it was the development of the steam locomotive that made possible the operation of a railway system that connected the nation. The steam locomotive was first developed in the north of England, and most of its essential features were known by 1829. The concept of steam railways, once proved in Britain, was rapidly exported to all developing countries. From these early days, a locomotive manufacturing industry developed to serve the needs of the home and overseas railways. Most of the Victorian railways also found it worthwhile to design and construct their own locomotives and rolling stock, and in Springburn, Glasgow, there arose a concentration of locomotive building works that served two mainline railways and two private locomotive builders. There was nothing else like it in Britain. Steam locomotives were also built in Kilmarnock, Airdrie, Leith, Dundee, Aberdeen and Inverness, and in smaller numbers elsewhere in Scotland. The SRPS steam locomotive collection represents both the main line and the industrial railways of Scotland. Most collection locomotives were built in Scotland, either in the factories of Springburn, or by Andrew Barclay, Sons & Co. at Kilmarnock. 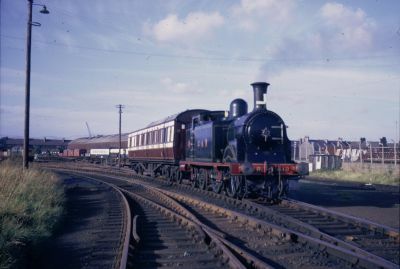 The latter, as Hunslet-Barclay, continues in existence, supplying the modern railway. For the latest information about ongoing work on our steam locomotives (and how you can help), see the SRPS Steam Locomotive Group website.